New color selections, a new aluminum wheel design for the LT models, and Siri Eyes Free technology summarize the changes to the 2015 Traverse. 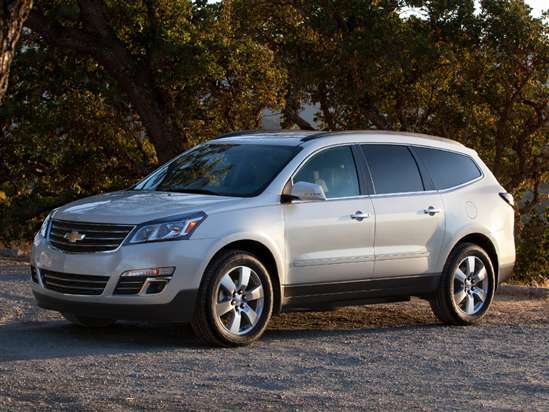 The 2015 Chevrolet Traverse is a full-size, 8-passenger, crossover SUV offering up to 116.3 cu.-ft. of cargo space. Think of it as a minivan without the sliding side doors, and you’ll get a sense of how much room is inside. Chevrolet sells the 2015 Traverse in LS, 1LT, 2LT, and LTZ trim levels. Upgrading to the 1LT model provides heated exterior mirrors with turn signal indicators, a power adjustable driver’s seat, rear parking assist sensors, remote engine starting, ambient cabin lighting, nicer interior and exterior trim, and 18-inch aluminum wheels. The Traverse 2LT is equipped with heated front seats, second-row captain’s chairs, triple-zone climate control, and a Chevrolet MyLink infotainment system hooked up to premium Bose speakers. This version of the Traverse also features an auto-dimming rearview mirror, a universal remote control, and a power tailgate. At the top of the lineup, the LTZ model adds leather seats, heated and ventilated front seats, a heated steering wheel, upgraded trim, bigger 20-inch aluminum wheels, and several safety technologies. A 281-horsepower, 3.6-liter V-6 engine is standard equipment for the Traverse LS, 1LT, and 2LT models, while the Traverse LTZ’s standard dual exhaust system bumps power output to 288 horses. A 6-speed automatic transmission delivers the power to the SUV’s front wheels, and an all-wheel-drive system is optional. Chevrolet also picks up the scheduled service tab for the first two years or 25,000 miles. In terms of fuel economy, it doesn’t matter whether or not you get a Traverse with AWD, because all models are EPA-rated to return 19 mpg in combined driving. In crash tests performed by the NHTSA, the 2015 Traverse earned a 5-star overall rating, the highest possible. The Insurance Institute for Highway Safety (IIHS) gives the Traverse the best rating of “Good” for all tests in which the SUV has been assessed. As this summary is written, the IIHS had not subjected the Traverse to its small overlap frontal impact test. In addition to a center-mounted, side-impact airbag for front seat occupants, every 2015 Traverse is equipped with a 6.5-inch color touchscreen radio, a reversing camera, and OnStar services with a free 6-month subscription to Automatic Crash Response, Turn-by-Turn Navigation, and other services. Traverse owners can also access various vehicle functions via a RemoteLink app downloaded to a smartphone. Rear park assist is added to the Traverse 1LT, while the Traverse 2LT gains a Chevrolet MyLink infotainment system with Internet radio, Bluetooth music streaming, Siri Eyes Free compatibility, and a Text Message Alert feature. Traverse LTZ models include blind-spot warning, rear cross-traffic warning, lane departure warning, and forward collision warning technologies. Chevrolet also offers a navigation system, a rear-seat entertainment system, and a premium surround sound audio system as options on selected Traverse models.